China Attacks VPN Services, Blocks Gmail access Completely! In an Outrageous move to achieve total ‘cyberspace sovereignty’, China has cracked down on couple of VPNs and proxy tools that allows internet users to access blocked Internet services. Reportedly, China has upgraded its Internet censorship system ‘The Great Firewall of China’ Which resulted in total blockage of Gmail Access in the Country. While Gmail along with other Google Services like Google+ and Drive has been blocked in China since June, Users were able to access it via third-party email clients such as Microsoft Outlook and Apple Mail which use Gmail’s IMAP/SMAP/POP Protocols. However, with this new ‘Internet censorship system’ UPDATE Gmail’s IMAP, SMAP, and POP servers are now fully blocked in China. China constitutes around 1/4 of the worlds Internet users, with average user spending almost 20 hours per week online. But the Government controls web activities, blocking sites like Google, Facebook and Twitter. Over 2 million people are employed to monitor online activities in the country who watches individual usage. Any messages deemed to be slanderous which are read more than 5000 times can result in upto 3 years imprisonment. The government says the controls help them curb the harmful effects of illegal information on state security. The rapid growth of the internet had made it harder for Chinese officials to control the Internet traffic and it was not difficult for users to access blocked sites with the help of VPN (Virtual Private Networks) or Proxy Servers. But as a result of Upgradation of China’s Internet censorship system, atleast 3 VPN services have been affected and others are facing serious Attacks from Chinese authorities. The 3 affected VPN services include StrongVPN, TunnelBear, and Astrill. StrongVPN has confirmed on its blog that it is suffering “connection issues” from China, While Astrill, a service mostly used by China’s business community, alerted its users of issues with its iOS client on its Twitter page. Chinese Government is showing increasingly aggressive attitude and taking bold moves to achieve what they call ‘internet sovereignty’. In the past two years Chinese Internet users have seen a consistent tightening of all kinds of censorship on the internet. 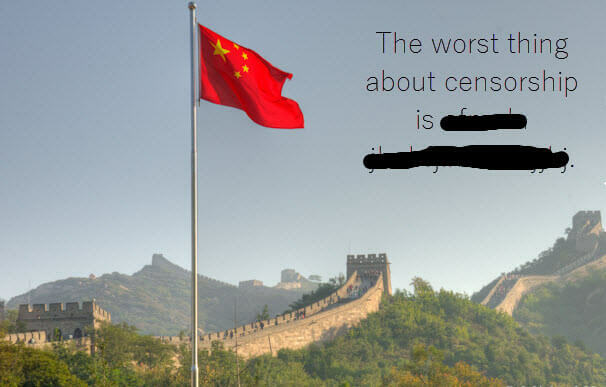 If you are from China, do checkout anti-censorship activist site GreatFire.org, which lets users see censored Social content and provides tools to access Blocked Sites.